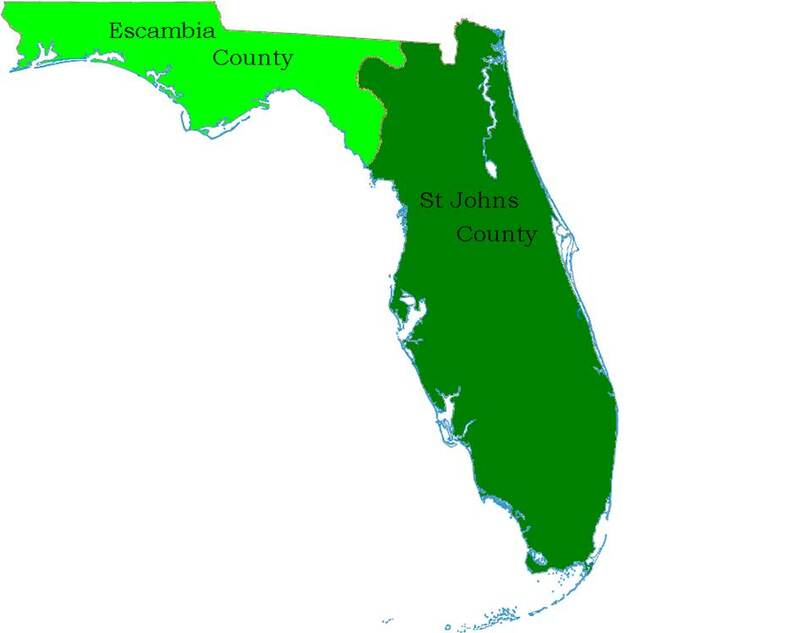 Above image - July 21st 1821 - Escambia County, (formerly West Florida) and St Johns County, (formerly East Florida) are created and a new line of division is decreed. The Suwannee River becomes the line of division, located east of the former Flint / Chatahoochee River border. The word Escambia has a disputed origin but may possibly originatate from the Native American word Shambia, meaning "clear water"
1.) Left - 1822 Jackson County is established from part of Escambia County, and later surveyed through the Federal Government Land Office installing TRS Grids. 2.) Left - 1823 Gadsden County is established from Jackson County, and later surveyed through the Federal Government Land Office installing TRS Grids. 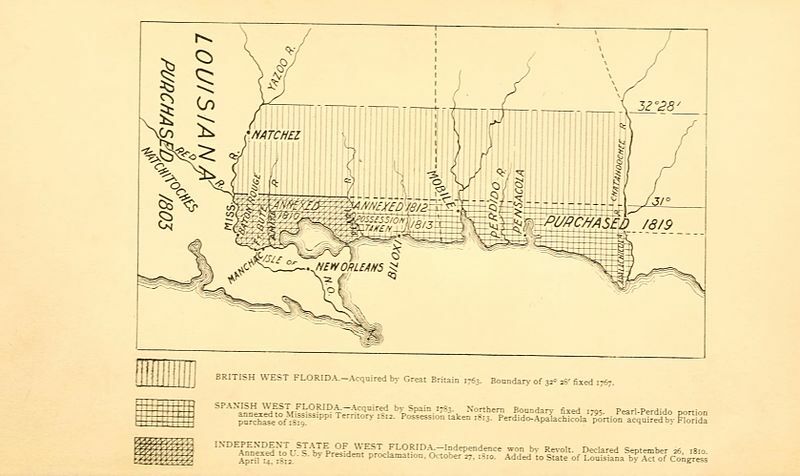 When Florida became a territory in 1821, Andrew Jackson was appointed Governor and among his first duties, he subdivided the state into two counties East Florida and West Florida. After several other divisions had taken place, on June 24, 1823, a fifth county (generally spoken of as Middle Florida) was established. Boundaries for the new county were the Suwannee on the east and the Apalachicola River on the west and it was named Gadsden in honor of James Gadsden, aide-de-camp to General Andrew Jackson in the Florida Campaign of 1818. Gadsden County was titled from within the bordered lands of Jackson County. Pensacola was the scene for the first Legislative Council and Jacksonville, the site for the second. These two sessions, two years and miles apart in hardship and distance, convinced the Council of the need for a central location. Two commissioners, Dr. William Hayne Simmons and John Lee Williams were selected to explore a possible site in Middle Florida. By March 4, 1824, these two commissioners reported they had chosen an area in Gadsden County, "about a mile southwest from the deserted fields of Tallahassee Indians Village about a mile south of the Oke-lock-o-ny and Tallahassee trails". Gadsden County citizens played important roles in the capital city building project. The temporary capital was erected in April 1824 by Jonathan Robinson and Sherod McCall. Their building was actually one of three log buildings constructed to accommodate the Legislative Council which met November 8 of that year. The capital remained in Gadsden County until December 29, 1824 when one of the first legislative acts that year was to create a new county (Leon) by annexing all the lands of East Gadsden between the Ocklochonee and Suwannee Rivers which, without moving the structures, moved the capital to Leon County. 3.) Left - 1824 Walton County is established from Escambia County, and later surveyed through the Federal Government Land Office installing TRS Grids. Walton County was created on December 29th, 1824 from Escambia County. It was named for Colonel George Walton, Secretary of the Florida territory from 1821 to 1826 during the territorial governorship of Andrew Jackson. Walton was the son of George Walton, Governor of Georgia and signer of the Declaration of Independence. Alaqua is named the first County Seat of Local Government. In 1830 there is a fire at the Alaqua Court House and it’s Public Records are lost.The Walton County Seat is moved to Eucheeanna. A second fire breaks out, fifty years after the first fire, and the 2nd Walton County Courthouse at Eucheeanna and its Public Records are lost. In 1886, the 3rd Walton County Courthouse opens in Defuniak Springs and is made from brick and stone. Washington County was titled from within the bordered lands of Walton and Jackson Counties in 1825. Holmes County was titled from within the bordered lands of Walton and Jackson Counties in 1848, after Florida had become a State. Okaloosa County (A native word meaning "a pleasant place," "black water", or "beautiful place") was titled from within the bordered lands of Walton and Santa Rosa Counties in 1915. 4.) Left - 1824 Leon County is established from Gadsden and Duval Counties, and later surveyed through the Federal Government Land Office installing TRS Grids. Leon County was created on December 29, 1824 from Gadsden and Duval Counties. It was named for Juan Ponce de León, the Spanish explorer who was the first recorded European to reach Florida. During the 1850s - 1860s, Leon County was a "cotton kingdom" and ranked 5th out of all of Florida and Georgia counties in the production of cotton from the 20 major plantations. Unlike all other Confederate capitols in the American Civil War, Tallahassee was never captured by the Union forces, and no Union Soldiers set foot in Leon County until Reconstruction. Washington County was created on December 29th 1825, by the Florida Territorial Council as the 12th county and was created from a portion of Jackson and Walton Counties. It was named after the first President of the U.S. George Washington. In 1913 Washington County was reduced in size when the southern portion of the county was annexed to create Bay County. The town of Vernon was the county's first seat of government and the town kept the County Seat from around 1850 until 1927 when the city of Chipley, after several attempts to get the County Seat moved there, won the distinction in an election over Vernon. The first Courthouse at Vernon, a wooden structure, burned around 1885, which destroyed all of the early county records except the school board minutes. Over a span of more than 150 years, Washington County has seen Native American, Spanish and English cultural influences. The County's historical lore is rich with stories of the exploits of Andrew Jackson. There are numerous Native American Mounds and evidence of strong settlements still being discovered. On Dec. 29, 1824 Walton County was established by federal survey with the express purpose of selling land to civilians. The settlement at Alaqua is named the first County Seat or center of Local Government. 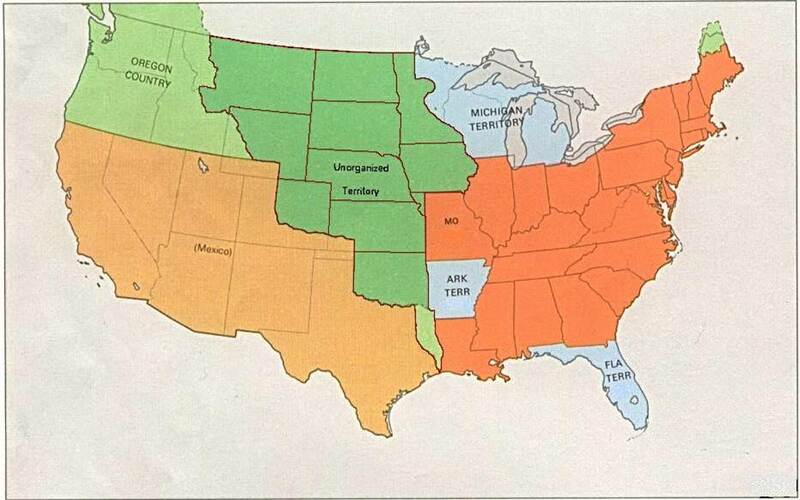 The United States Government Land Office sends in more and more Deputy U.S. Surveyors to officially establish the Township Range System Grid (TRS) in the Florida Territory.